1. Listen closely to the question. – Make sure you understand completely before you answer. If there is any part of the question you do not understand, say so. Take your time when answering. 2. Answer only the question. – Answer the question asked and say no more than is necessary. Do not volunteer extra information or provide explanations. 3. Do not guess. – If you don’t know the answer, say so. If you don’t remember, say so. It is your job to give the answers you know, and not to speculate about the answers you don’t. Most people are generally bad at estimating time and distance. It’s much better to use general terms when describing distances or time. 4. You are not a lawyer. – You are a witness, or party to the lawsuit. Do not argue with the lawyer on the other side. Do not object. Do not try to sell the case. Simply answer the questions asked. 5. Watch out for questions that paraphrase your answer. – Many times attorneys take your answers and restate them in different words. This may change the meaning in ways that you might not catch at the time. 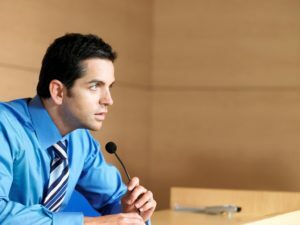 If the lawyer asks if his paraphrasing is accurate, you are entitled to say that you prefer to keep the answer the way it was originally stated. 6. Beware of absolutes. – Watch for questions that use the words always and never. 7. Admit to preparing for the deposition. – There is nothing wrong with going over your testimony in advance. It would be irresponsible not to prepare. 8. If your attorney objects, beware. – If you are speaking, stop talking at once. An objection from your lawyer is a danger sign. It says you should remain silent and follow the lead. 9. Correct your mistakes right away. – If you realize you have made a mistake in your testimony, let your attorney know before for the deposition is over. Mistakes need to be addressed immediately. 10. Take a break. – If you are tired, need to go the restroom, or want a drink, say so. It is not an interrogation, and breaks are permissible. Your attorney may request a break for you if you start to get argumentative or overly talkative. Following these tips should help you provide a clear, concise testimony that will be helpful in resolving the case.